Molweni, Dumelang, Goeie Dag, Hello from Cape Town! We are the WFOT: Local Operations Committee. We are excited to welcome you to the Congress this year and have been tasked with planning professional visits that will allow you to experience OT with a uniquely South African Flavour. We have 5 domains within OT, South Africa and have used these to select a variety of sites for you to visit. These are Physical Health, Mental Health, Child Learning and Development, Community Development and Work Practice. Looking forward to seeing you May, 2018. More information will be available on the website. Watch this space! 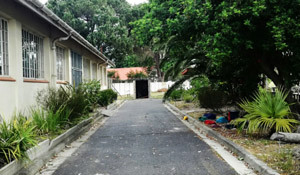 As a result of the immense pressure on in-patient services, the management team of Stikland Psychiatric Hospital decided to introduce a community day treatment centre as part of the services that the hospital renders to its service users. The possibility of starting an out-patient treatment programme based on the principles of psychosocial rehabilitation was welcomed by hospital staff as a possible solution for the revolving door phenomenon. It was expected that the service would bridge the gap between in- and out-patient services. The community day treatment centre, referred to as the Specialized Ambulatory Treatment Service Centre (SATS Centre) was launched in February 2009. 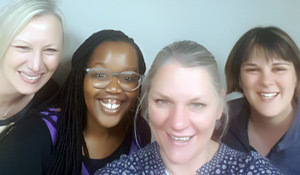 Two members of the occupational therapy department - an occupational therapist and an occupational therapy technician - were assigned to the development and management of the SATS Centre. 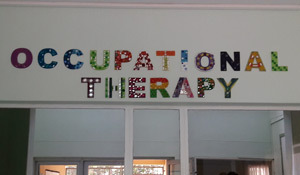 The types of interventions given by the occupational therapist and occupational therapy technician changed annually according to the needs or preferences of the mental health care users, the skills set of staff, resources and the number of mental health care users attending the centre. Therapy ranges from cognitive stimulation groups, art and craft groups, life skills groups, gardening groups, psycho-education and drumming groups. Individual therapy is also done as needed. Attendance to the SATS Centre is voluntary. All mental health care users who make use of the centre are adults of 18 years or older, reside in the Stikland Hospital catchment area, have a mental health illness and received medication. 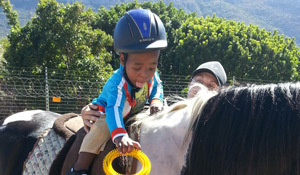 Hippotherapy is a treatment strategy that utilizes equine movement; it can be used by an Occupational Therapist, Physiotherapist or Speech Therapist. Hippotherapy is utilised as part of an integrated treatment program to achieve functional outcomes. It is used to address a wide variety of impairments, functional limitations, and disabilities in patients with neuromotor and/or sensory dysfunction. The population serviced: children from a local NPO, with physical and intellectual impairment (cerebral palsy, autism, down syndrome). SLEAK is a non-profitable after school project for underprivileged youths (aged 10-13 years) to teach them age appropriate work abilities in a safe environment - keeping them off the streets and away from drug and gang activities. Part of the aim of SLEAK is to reduce the learners' participation in destructive leisure time activities and instead teach them new leisure activities that they can do at home and school that are meaningful and constructive. We have three volunteers from the community that helps to present the group and acts as positive role-models to the kids. 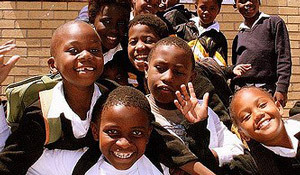 The Schools Improvement Initiative (SII) draws on the university's broader resources to assist the Western Cape Education Department in improving the quality of education in this Province. The SII's model of school improvement is sought through the development of strong university-school partnerships. 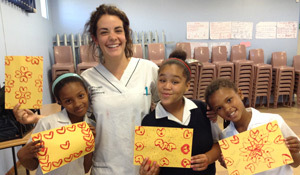 Intshayelelo Primary School is one of two schools where the SII in collaboration with the Faculty of Health Sciences has supported the placement of students undertaking the practical component of their qualifications in Occupational Therapy, Speech Therapy and Audiology. The Clothing Industry Health Care Fund (CIHCF) provides an exciting opportunity for involvement in a work rehabilitation service that operates through a primary health care centre as well as through clothing factories. Elsies River Health Centre is one of seven CIHCF clinics in the Western Cape, but it is the only clinic with OT services. 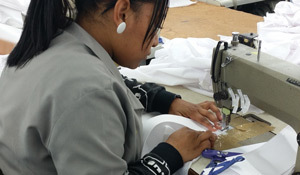 The CIHCF together with Stellenbosch University's Occupational Therapy department provide direct and indirect OT services to the clothing industry workers. Clients are all clothing factory workers, mostly female. Predominantly upper limb conditions are seen (mostly work related upper limb disorders such as Carpal Tunnel Syndrome and De Quervain's Tenosynovitis, with some hand fractures and sprains) as well as some back conditions and other chronic conditions affecting functional performance (e.g. Arthritis). Work rehabilitation is aimed at improving clients' work performance and satisfaction, reducing pain and discomfort at work and enabling clients to maintain the worker role for as long as possible. Valkenberg Hospital is the oldest psychiatric hospital in the Western Cape. We serve mental health care users who present with severe mental illness. Our Occupational Therapy staff work in 2 sections of the hospital: Adult Acute Psychiatry and Forensic Psychiatry. We offer a range of interventions that include group work, individual interventions focused on patient choice(s), vocational rehabilitation, supported employment, supported education and forensic observation assessment. 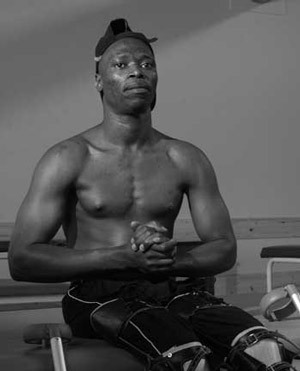 Western Cape Rehabilitation Centre (WCRC), for Persons with Physical Disabilities, is a specialised rehabilitation centre, which accepts appropriate referrals from all levels of health services. The Pebbles Centre is located on Villiera Wine Farm, owned by Simon Grier. Our offices are situated in the beautiful winelands of the Western Cape. 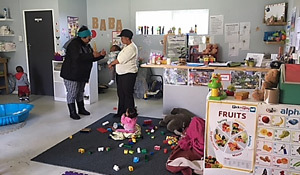 OT services are provided to young children in our Early Childhood Development centres in Stellenbosch, Wellington, Riebeek Kasteel, Hemel-en-Aarde as well as Citrusal. OT services are planned to support young children from 3 months to 5 years of age. 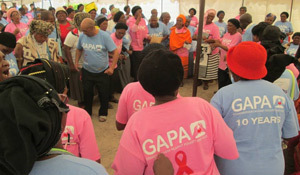 Founded in 2001 by 10 grandmothers and an occupational therapists, Grandmothers Against Poverty and Aids (GAPA) implements self-help, education and support programmes for and by grandmothers affected by HIV/AIDS and poverty. These programmes aim to improve the grandmothers' quality of life within their families and communities. Chris Steytler Industries is a protected workshop. We cater for the needs of all diagnoses. Workers enter this facility via a work preparation program that is run by OT student from the local universities. During this program their ability to work is assessed and problems are addressed. After the program they either stay on at this facility where they become permanent workers or, if they are not suited to work at this facility, they are supported into alternative possibilities. Chris Steytler Industries performs contract work for factories. This includes packaging, degating, recycling, etc. 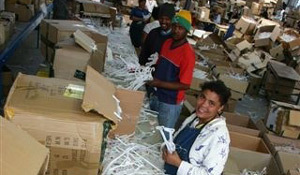 Further development of workers is one of the main responsibilities of the OT. Workers who show the potential are developed into more responsible supervisory positions in the factory and may also be given the opportunity to work in the open labour market on a temporary or permanent basis. OT supports workers in both these processes. In the factory the OT is also responsible for the health and safety of workers and, because some of the work is very repetitive in nature has to pay close attention to ergonomics.